One look at the Old Mission Inn and it seems no accident that the first word in its name is “Old”. 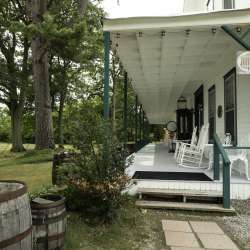 This grand place, Michigan’s oldest operating historic hotel, is much more than an Up North getaway, it’s a historical landmark that celebrates its storied past every day. Angie, together with her husband, Bruce, and their son, Tyler, did much more than just preserve this historical gem. They thoroughly researched the history of the property and worked to secure relevant memorabilia. 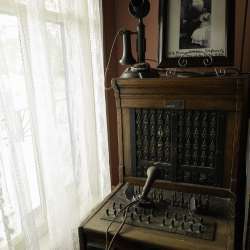 “We located a 1906 telephone switchboard that was used at the Inn,” Angie explains. “We also secured an American flag from 1870…there are only 38 stars on it.“ The Inn has a 70’ long “hall of history” with archival photos of the steam ships, stagecoaches, and other elements of early life on the Old Mission Peninsula. 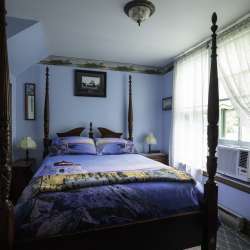 While the Inn itself is historical, its amenities are anything but that. The well-appointed rooms are the epitome of elegance and comfort. Modern, even gracious, bathrooms, are welcome upgrades to the chamber pots that were used over a century ago. Breakfast is wonderfully homemade and tailored to each guest’s liking. Guests are provided a menu from which they can choose Belgian waffles, eggs of any style, fresh fruit and—a guest favorite—Bruce’s signature crispy bacon.